Champions Orange Telkom won against Ghana police 3-2 in post penalty shot out to defend the Africa Cup of club championship in Lusaka Zambia last weekend. The national champions had played to 1-all draw against the West Africans in the regular time at the Olympic development centre Stadium. The match which was rained off on Saturday and rescheduled for Sunday saw the two goals netted scored in the second half as Kenyan International striker Jacqueline Jow scored in the in the 53 rd minute through a penalty corner, while Linda Sasu leveled the scores in the 56 th minute through a penalty corner. The Jos Openda coached side had overpowered Ghana Revenue Authority (GRA) 2-0 in the semi final played on Thursday, while their opponents Ghana Police overpowered Sharkia of Egypt winning 6-1 in another semi to book an East verses West African final. 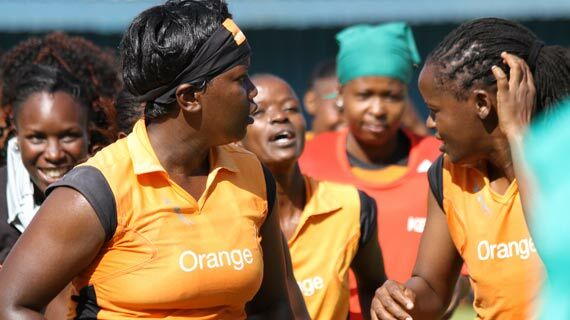 Telkom Orange penalty goals came through Audrey Omaido, Barbara Simiyu and experienced defender Teresa Juma. Jacqueline Wangeci Jow missed her penalty. Ghana Police scored through Rejoice Noi and Serwaa Boakye , while Nafisata Umaru, Cecilia Amoako and Evelyne Fiadoh missed their penalties.